The value of newspapers in our ancestral research can't be stressed often enough. For those of us whose forebears didn't have the courtesy to leave a large paper trail in court documents, their occasional appearance in the local paper is spotted with excitement. At last, another crumb to follow! But newspapers weren't published for the benefit of someone in the future studying their ancestry. They were mostly printed on cheap materials meant to be thrown away. Where they survive, the runs of available copies probably aren't complete. Currently, online access represents only a portion of what might be locked away in distant vaults. Where an "index" of sorts is available, it probably relies upon OCR (optical character recognition) technology, which produces either false positives, or misses entries entirely. Blurred, water-stained pages with antique font are not technology-friendly. As is the case when using any sort of record, the biggest obstacles might be those we place in our own way. Take, as an example, this entry pertaining to my ongoing research into the Largent family, of West Virginia, Kentucky, Ohio, and Indiana. This image is courtesy of the Hoosier State Chronicles, part of the Indiana State Library. It currently displays over 362,000 pages of Indiana newspapers. Note that the title of the paper, the Indiana Tribüne, features an umlaut, a mark placed over a vowel in German and Hungarian. This labor newspaper was published in Indianapolis for 53 years, claiming in 1898 to have the largest circulation of the German-language daily papers in Indiana. It ceased publication in 1918, amid strong anti-German sentiment throughout the country during WWI. Closer examination shows that Lurena's name appears among those "heirathen," which means to marry or wed. 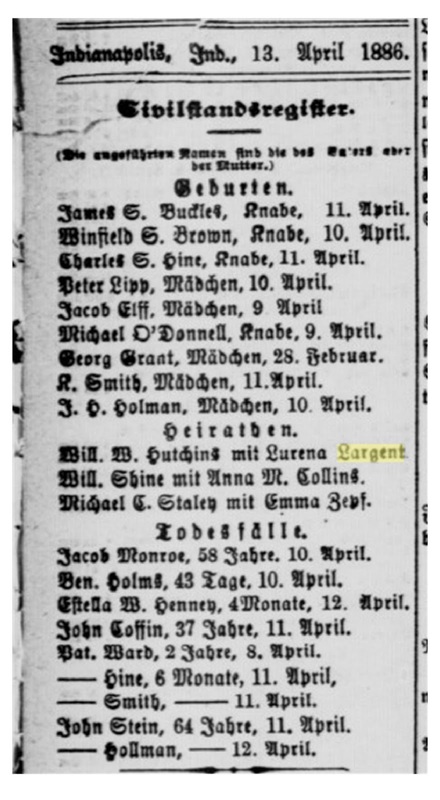 The names above are "Geburten" or births. Using other sources, I have established that Lurena Largent is a distant cousin of mine with several removes. Nothing in her ancestry suggests a connection to the German language. What little I know of her husband, William W. Hutchins, doesn't either. I believe these events were routinely copied out of local civil registers for publication. The inclusion of Michael O'Donnell in the births would seem to confirm that. So, what if I'd gone about this search in a different way? What if I'd looked at a list of available newspapers and said, "Oh, I won't bother with that one, it's in German, and she wouldn't be there." What if this is the only place she's named? This is one of those couples whose paper trail is meager. The most frightening question I came away with? What have I missed along the way?